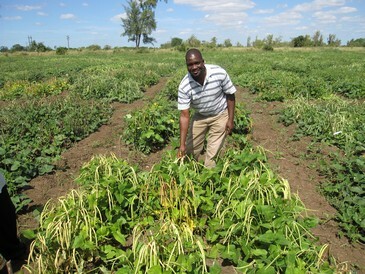 ‘Milking’ cowpeas in Mozambique for protein and profit… plus a pox upon pests! Today, we travel the Milky Way on a voyage to Mozambique. Our man along the Milky Way is Rogério Marcos Chiulele (pictured), a lecturer at Mozambique’s Universidade Eduardo Mondlane’s Crop Science Department. He is also the lead scientist for cowpea research in Mozambique for the Tropical Legumes I (TLI) project. This gives Rogério a crucial tri-focal down-to-earth and away-from-the-clouds perspective on cowpea pedagogy, research and development. It is through this pragmatic triple-lens prism that Rogerio speaks to us today, once he’s captained us safely back from the stars to Planet Earth, Southeast Africa. After the protein and profit, next stop for him and team is ridding cowpeas of pod-sucking pests, among other things slated for the future. But back from the future to the present and its rooted realities…Problems, yes, but also lots of good scores, plus a deft sleight of hand that are bound to have you starry-eyed, we bet. Q: Tell us about Mozambique and cowpeas: are they important? 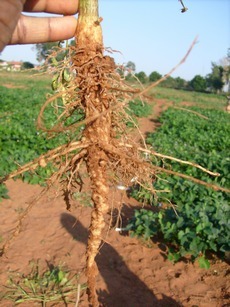 The devastating effects of nematodes on cowpea roots. In Mozambique, cowpeas are an important source of food, for both protein and profit, particularly for the resource-poor households that benefit from cowpea income and nutrition. In terms of cultivation, cowpeas rank fourth as the most cultivated crop after maize, cassava and groundnuts, accounting for about 9 percent of the total cultivated area, and estimated at nearly four million hectares of smallholder farms. The crop is produced for grain and leaves, mostly for household consumption but it is becoming increasingly important as a supplement for household income. But while its potential for food, protein and income is recognised, the realisation of such potential is still limited by drought due to irregular and insufficient rain; affliction by pests such as aphids, flower thrips and nematodes; diseases such as cowpea aphid mosaic virus and cowpea golden mosaic virus; and cultivation of low-yielding and non-improved varieties. Q: And on cowpea research and breeding? Since 2008, Universidade Eduardo Mondlane [UEM] established a cowpea-breeding programme for addressing some of the limiting constraints affecting cowpea production and productivity. This has been possible through collaboration with different funding institutions such as the Generation Challenge Programme. 2008: Screening of the 300 genotypes. That same year , a UEM research team that I coordinate qualified for a GCP capacity-building à la carte grant. 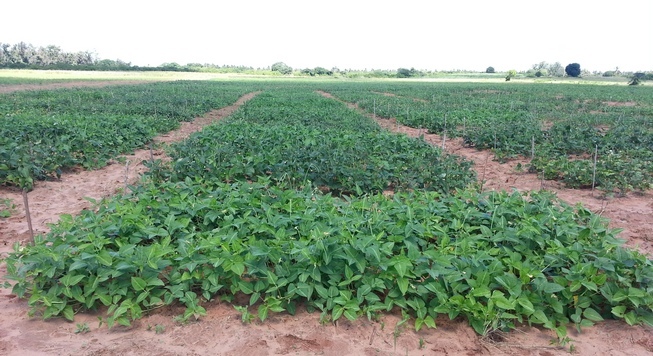 In this project, we screened 300 Mozambican cowpea lines for drought tolerance. From these, we identified 84 genotypes that were either high-yielding or drought-tolerant. We further evaluated the 84 genotypes for another three seasons in two locations. From the 84, we identified six genotypes that not only had the two sought-after traits, but were also adapted to different environments. In 2010, the UEM team joined the TLI project. For the six pre-identified genotypes, the UEM breeding programme is using marker-assisted recurrent selection [MARS] and marker-assisted backcrossing [MABC], combining drought tolerance and resistance to major biotic stresses occurring in Mozambique. In MABC, we are conducting a backcross to varieties with traits that farmers prefer, which includes aspects such as large seeds, early maturity and high leaf production. Q: What is the main focus in your work, and how and when do farmers come in? The breeding work conducted by UEM is targeting all Mozambican agroecologies, but with particular focus on southern Mozambique which is drought-prone. In addition to drought, the area is plagued by many pests such as aphids, flower thrips, nematodes and pod-sucking pests. So, in addition to drought tolerance, we are conducting screening and selection for resistance to aphids, flower thrips and nematodes. In the near future, we will start screening for resistance to pod-sucking pests. 2009: Rogério during field screening of the 84 genotypes in different locations. In 2009, we conducted a farmers’ participatory varietal selection to glean farmers’ perceptions and preferences on cowpea varieties and traits. From the study, six of the lines passed participatory variety selection with farmers, as they were large-seeded with good leaf production which provides additional food. Q: To what would you attribute the successes your team is scoring, and what are your goals for the future, besides screening for pod-sucking pests? The success of the work that the Eduardo Mondlane team is doing is partly due to the collaboration and partnership with USA’s University of California, Riverside [UCR]. UCR sent us 60 lines from the GCP cowpea reference set* [Editorial note: see explanation at the bottom], which we evaluated for drought tolerance for four seasons in two locations – one with average rainfall and the other drought-prone. As these lines were already drought-tolerant, we tested them for adaptation to the local environment, and for high yield. From the set, we hope to release three varieties in 2015. In addition, for evaluating the different varieties, we also crossed the local varieties with black-eyed peas, which have a huge market appeal: local varieties fetch roughly half a US dollar per kilo, compared to black-eyed peas whose price is in the region of four to five US dollars. Our involvement with GCP has not only increased our exposure, but also brought along tangible benefits. 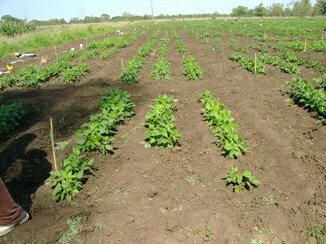 For example, previously, nothing was being done on drought tolerance for cowpeas. But now we receive and exchange material, for example, the black-eyed peas from UCR that we received through GCP, which are set to boost production and markets, thereby improving lives and livelihoods. Amongst the varieties we are proposing to release is one black-eye type. I firmly believe black-eyed peas can really make a difference. In addition, besides funding a PhD for one of our researchers, Arsenio Ndeve, who is currently at UCR, the Generation Challenge Programme, contributed to improvement on storage and irrigation facilities. We purchased five deep freezers for seed storage and one irrigation pump. Presently, we have adequate storage facilities and we conduct trials even during the off-season, thanks to the irrigation pump provided by GCP.